When I saw Wendy Wasserstein sitting in an audience in New York City, I was like all the others Julie Salamon said “would stop her on the street…not with starstruck awe but with familiarity…” Like everyone else, I thought I knew her; I even have a friend who went to Mt. Holyoke, her alma mater. Watching her plays felt like having a private conversation with a good friend. 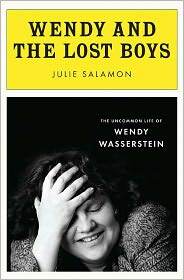 In Wendy and the Lost Boys, a biography of Wendy Wasserstein, Salamon promises to reveal some of the private secrets behind the public life of the playwright. Francine Prose, wrote a review of the book for the New York Times: What Wendy Wasserstein Wrought. Charles Isherwood’s 2006 article – Her Plays Spoke to a Generation – not only summarizes her writings and craft but also shows her as the flagbearer for women who could laugh at themselves while they thought they could or should have it all – husband, children, and career. For Wendy, two out of three wasn’t bad.